All students at Heritage Oak attend regular music and art classes as part of their weekly curriculum. Through these important classes, children develop a deep appreciation for the arts while refining their academic skills in a hands-on environment. Develop an understanding in the areas of musical elements, productions and performance, and music appreciation. Building upon the current introduction to music program in preschool and kindergarten, all Heritage Oak first through third graders study the violin. The children learn general music theory and history through hands-on experience with age-appropriate, custom-sized violins. This innovative program empowers students to confidently express their individuality while inspiring them to enjoy a lifetime of music. Heritage Oak not only values the arts but it also cultivates artists. 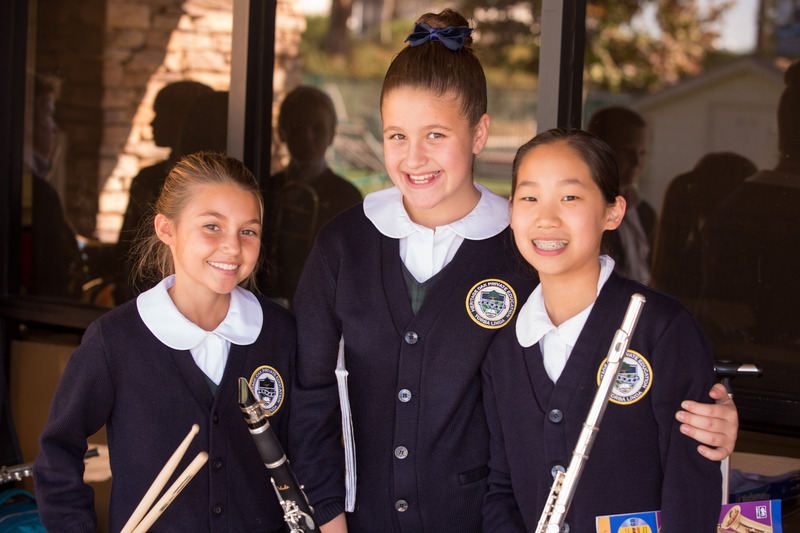 The school believes that the arts serve to develop one’s self-esteem and sense of self-worth by providing a safe forum for creative expression and discovery. Through an interweaving of the psychomotor, affective, and cognitive domains of knowledge, the Heritage Oak violin program will offer “minds on” rather than just “hands on” learning. Violins are made in all different sizes, which makes learning easier for younger students. Violin study strengthens critical thinking as children are guided to apply their own metacognitive abilities to explain the types of strategies used for remembering what musical symbols mean. Violin study promotes problem solving as students are directed through skill mastery and then challenged to evaluate their own work and apply new understanding. Violin study teaches global understanding as students learn how to view the world in a different light through exposure to a variety of diverse musical selections. The Heritage Oak Band and Orchestra programs provide an excellent comprehensive music experience from 4th grade through middle school. The program is geared to teach not only musical, but also personal, and life skills. A key tool in the Heritage Oak music program is a software program called Smart Music, which will provide accompaniments for daily home practice and offer diagnostic capabilities to help students reach their individual musical goals. At Heritage Oak, students will learn art techniques and concepts through instruction, example and encouragement. Art class will be used as a tool to build confidence, problem solve, create cultural awareness, gain personal satisfaction through individual accomplishments, exercise imagination, improve critical thinking skills, develop concentration, discover the joy of learning, and better understand themselves and the world around them. Kindergarten students develop skills in the use of tools and techniques, such as how to hold a paintbrush properly and coloring in one direction. Students work with various mediums including crayons, paint, clay, and collage materials. The children use lines, shapes, and colors to make patterns, animals, faces and other exciting works of art. The first grade students focus on drawing and painting techniques to make a landscape, still life, and portrait. The children learn about primary colors and how to mix and create secondary colors. Materials used include watercolor, tempera paint, chalk pastels, ink, and clay. Students study the master artists Claude Monet, Vincent van Gogh, and Pablo Picasso. At this level, the students learn how to communicate emotion and ideas through art. Children study balance and symmetry; identify patterns in nature and works of art; and differentiate the use of warm and cool colors to express feelings. The students use watercolor, tempera paint, oil pastels, and clay to create their masterpieces. The second grade students learn about master artist, Gustav Klimt contemporary artist/designer Laurel Burch, and marine life artist Robert Wyland. The third grade students learn about the illusion of space and create a composition showing foreground, middle ground, and background. They study the use of lines and how they can create a feeling of rhythm and movement. Students learn how to blend colors to create tints, shades, and the illusion of form. After viewing the works of Vincent van Gogh and Paul Cezanne, and Wayne Thiebauld, the students create colorful masterpieces using the artists’ style. The fourth grade students study the lives and works of artists such as Georgia O’Keeffe, Henri Matisse, Keith Haring, and Andy Warhol. Fourth graders demonstrate skills using complimentary color pairs, positive and negative space in a work of art, and use shading techniques to create depth. After a discussion on human proportions, the children create wire figures in action poses to show movement through the use of diagonal and curving lines. The Heritage Oak fifth graders learn about optical illusions, perspective, and abstract art. Art projects include a one-point perspective cityscape or landscape, an abstract guitar collage, a cut paper self portrait, and a big cat painting. Watercolor, tempera paint, oil pastels, chalk, clay, and paper mache are all used this year. Sixth graders use a variety of materials such as watercolor, pastels, paper mache, and clay. Art projects include Pop Art paintings, Origami, animal sculptures, and wire designs. Students have the opportunity to enter various art contests and exhibit their art skills. Seventh graders use a variety of materials such as watercolor, pastels, tempera paint, aluminum paper, clay, and paper mache. Art projects include two-point perspective cityscape construction, still life collages, and mask making. The students also have the opportunity to enter various art contests and exhibit their art skills. Eighth grade students take a deep look into the elements and principals of art. Students are introduced to a wide variety of styles and techniques which are incorporated into their own artistic work. The focus is on drawing, painting, and sculpture. Some of the materials include, paint, ink, clay, and plaster. Additional masterpieces created this year are pointillism designs, masks, and kaleidoscope designs. The students also have the opportunity to enter various art contests and exhibit their art skills. Heritage Oak's 4th-8th Grade Instrumental Music groups have placed first in various festivals including those held at Carnegie Hall in New York City and the Kennedy Center in Washington D.C. Most recently, Heritage Oak won the overall sweepstakes award when competing against high schools at the 2016 Heritage Festival held at Fullerton College.